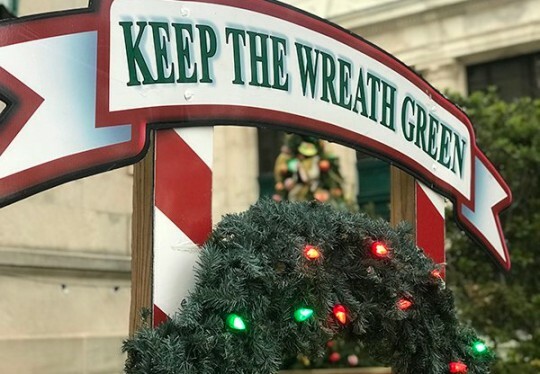 Escambia County Fire Rescue, in collaboration with the Pensacola Fire Department, launched its annual “Keep the Wreath Green” fire safety campaign on Saturday. While a joyous time of year, cold weather, holiday decorations and festivities can create serious fire dangers. Firefighters hope to reduce the number of fires by promoting simple, lifesaving holiday safety tips each day in December. During the month-long campaign, five-foot wreaths are on display at 18 county fire stations and five city fire stations, with wreaths were placed outside Escambia County’s Ernie Lee Magaha Government Building downtown, the Escambia County Public Safety Building, Pensacola City Hall and Cordova Mall near the food court entrance. Each time firefighters respond to a residential fire with damage, a green light bulb will be replaced with a red one to remind citizens of the dangers posed by fires in residential home. In 2017, 10 bulbs were changed to red on county wreaths, and the city had seven red bulbs. According to the United States Fire Administration, fires occurring during the winter claim the lives of over 900 people and cause over $2.1 billion in damage. Nationally, cooking is the leading cause of home winter fires, with 5 to 8 p.m. being the most common time for a fire to occur. A working smoke detector cuts the chances of dying in a reported fire in half. For information about obtaining a home smoke detector, call Escambia County Fire Rescue at (850) 595-HERO (4376) or (850) 436-5200 for city of Pensacola residents.